I was in the process of planning my first ever SD pheasant hunting trip - searching internet sites, talking to friends who had hunted there before, and printing maps and information from all the SD public hunting areas and state leased walk-in area - when a list of updated properties arrived in the mail from Hunting Sports Plus. When I opened the envelope I was pleasantly surprised to see that the club had just recently leased several properties in SD for pheasant. I immediately forgot about most of my previous efforts and began planning 2 short trips to hunt on several of these properties. My 1st trip was for the 3 days after Thanksgiving, when my non-hunting wife accompanied me. On our way to our first day of hunting the one thing that kept going through my mind was that this was reasonably late in the season (the pheasants had been hunted for nearly 5 weeks already) and I just was hoping we would get to see enough birds to keep things interesting. 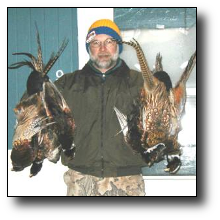 But I was going to SD pheasant hunting and fulfilling a lifelong dream and could not wait to get there. We arrived about 11:00 aM and were impressed with the cover we saw on the property. We parked, got out of our vehicle and as we closed the doors my worries vanished as about a dozen pheasants including several roosters flushed in the field next to us. By the time we had our 3 English Setters out and had walked about 1/4 mile through a narrow strip of cover we had already seen more pheasants then during most entire seasons in the other states I've hunted in the past (PA, MO & KS). It quickly became obvious that these were wild and smart birds and would require a change in tactics if we hoped to get within range of any of these roosters. after we put up 2 of the dogs, removed the beeper collars and stashed the whistle, we switched to "silent mode" and soon started to score on some SD roosters. at the end of the day this was all one could hope for - a limit of wild pheasants, happy dogs, a tired hunter and seeing more pheasants than I had ever seen in my life. While the hunting was challenging we had seen well over a hundred roosters, many more hens and we were hunting a property that wasn't even in what was considered the prime pheasant area of SD. We could only image what the hunting would be like on the other properties in the prime areas. To make a long story short, the remainder of this first trip was great as we limited out on the second day after seeing hundreds of pheasants and got 2 roosters on the 3rd day hunting a property with poor cover that prevented us from getting close to the hundreds of pheasants we saw before we left early to beat a major blizzard home. My 2nd trip was for the 5 days starting the Saturday 1 week before Christmas Eve, when my best hunting buddy (my son) was on Christmas break and anxious to get his first taste of SD pheasant hunting. Like me on my 1st trip he was wondering if we would get to see enough birds to keep things interesting, considering that the season had already been open for 2 months and would end the week after we were there. On the 1st day we again hunted the same property I hunted the 1st day of my first trip. While the pheasants were even wilder this time, the results were again good with us ending up with 2 limits of pheasants and seeing well over a hundred roosters and many more hens. My son was thrilled with the hunting and couldn't believe it when I told him he hadn't seen anything yet. The remainder of this trip was great as we limited out on all 4 days after seeing hundreds of pheasants on each property. The second day was especially memorable as the owners of the property guided us around and really enjoyed watching us hunt. They made sure we had a great time in spite of the sub-zero temperatures. The hunting on this farm was unbelievable as we saw uncountable numbers of pheasants that I would guess number well over a thousand birds. In closing I would like to thank Kit Maxfield for finding these properties and I really hope our clubs keeps most of these properties. I'm already planning to make more than 2 trips to SD in 2006. If you've never hunted pheasants in SD you don't know what you are missing.